It’s time for another color. I’m getting close to the finish, I just haven’t decided on how many more steps to include. I like to print a color and then ignore the image for a day or so. That way when I come back to the studio all of the ideas that were influenced by the last printing have somewhat evaporated and I can look towards the next step more impartially. On another note, color-wise, we are getting darker. So todays color is THE closest point of the image to the viewer. 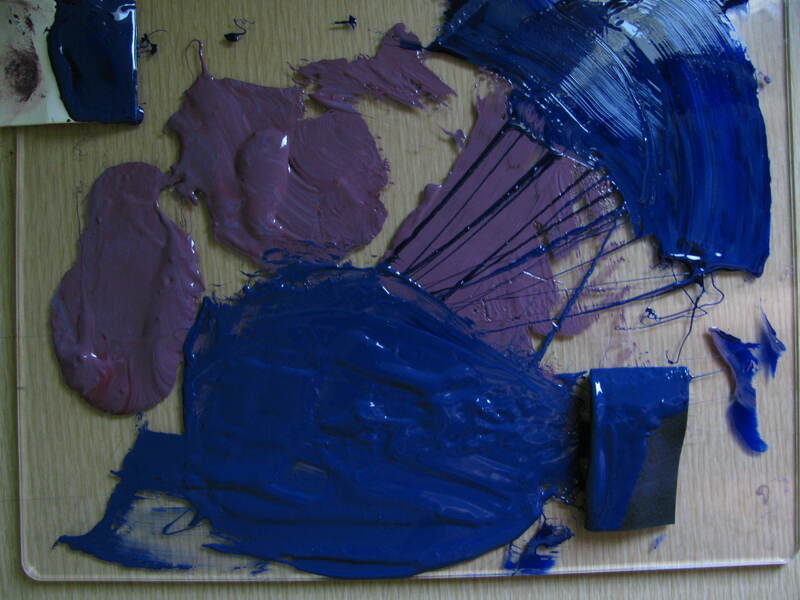 In keeping with the red, blue, orange (and the red+blue combo that is purple), I chose a dark, saturated blue. 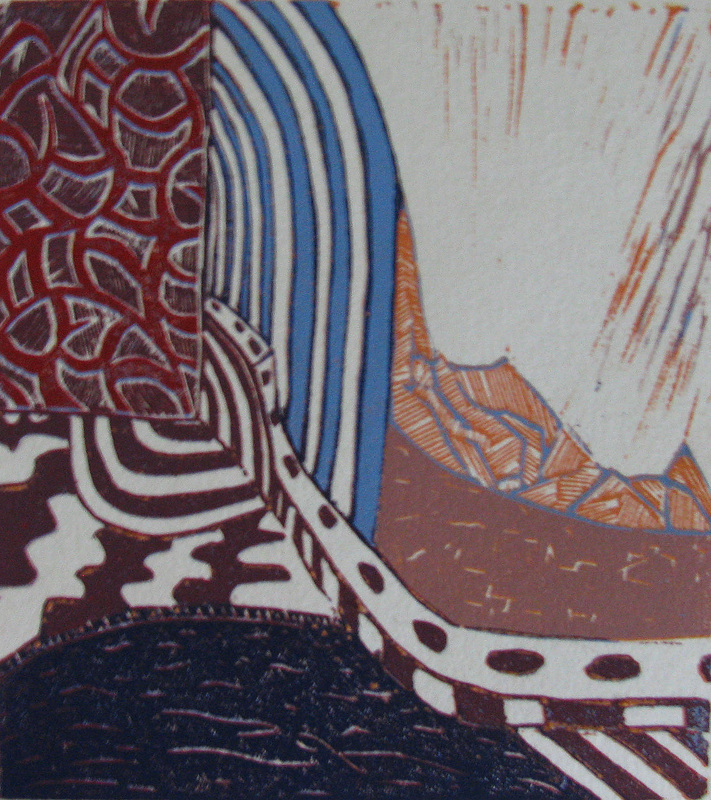 I mixed a little of the previous purple into the blue and expect the last printing to influence the color as well. 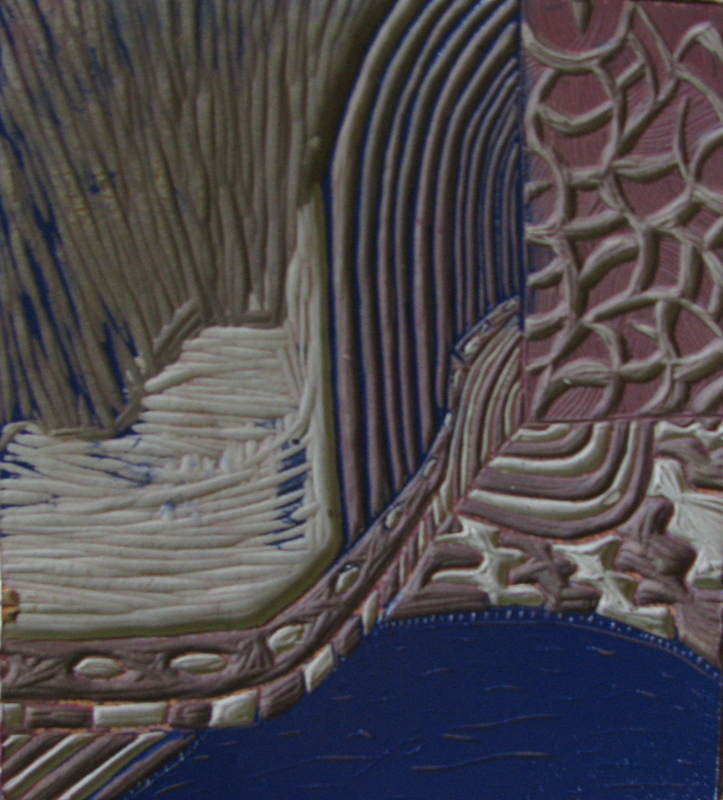 I’ve carved out the rest of the background and some of the waving lines up front that I want to remain purple. Also, I’ve selectively inked the plate to highlight the lighter blue lines in the middle ground and create a water pool as the foreground. It was actually a relatively light day outside for this time in Portland. Not sunny, not rainy, just not dark and gray. I’ll take it. Now to forget about it for a couple of days, but first, I want to share a brand new addition to my work space. I noticed that the prints weren’t drying as well in the cardboard box recently. My wife Alyssa and I chalked it up to how humid the house has been with all the late winter Portland rain. So I made this hanging device. I used hemp twine and binder clips. Both were purchased at SCRAP. The hemp twine I’ve had for a few years and don’t remember how much it was, but the binder clips were something like five cents each. 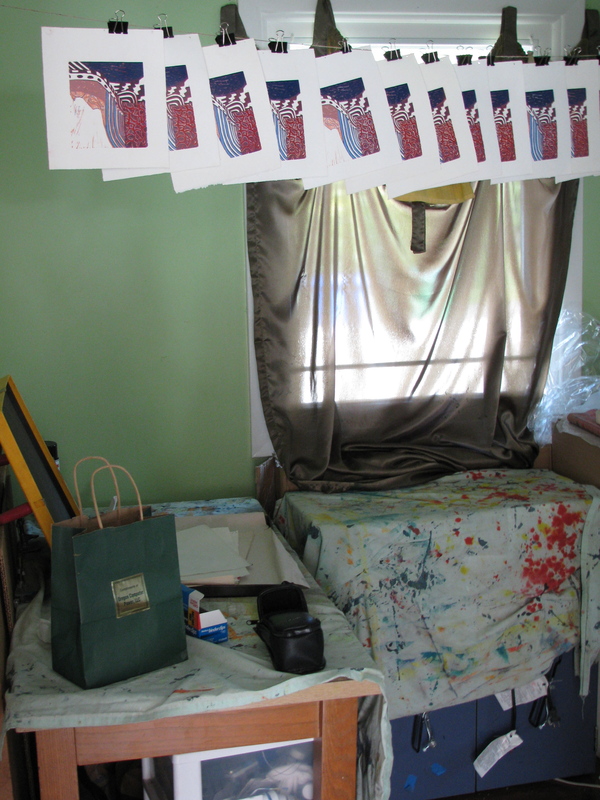 I use that nice green bag to hold all of my binder clips, and as you can see, I cover my work area with tarps when I’m finished for the day. This ensures both cat safety and print safety. I don’t want my little wonders to get into anything I may have missed during cleanup, although I’m pretty thorough, and I don’t want their little hairs all over my work area. Win-Win. Good idea Drew. I have cats who often have their paws covered in paint! Definitely going to make a drying device like yours..
Yeah, it’s pretty amusing to see their faces when I first strung my prints up there. I had to go to work, and half expected everything to be torn down when I got back. But for the most part they just watch it like it’s another channel of cat tv. Too cool for cats !!! 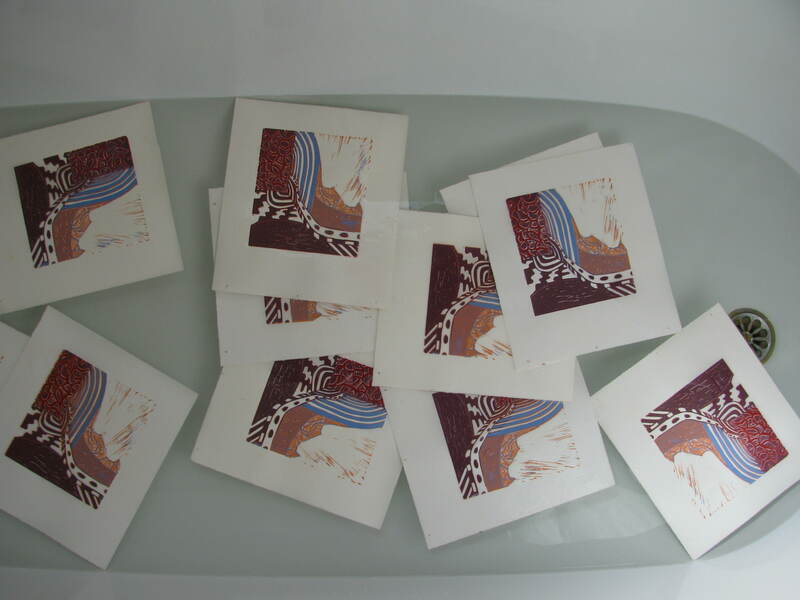 Hi Drew – I’ve enjoyed reading your blog entries about the print making process. It’s funny that no matter where you are in the world, humidity is a concern with prints. I interned as a docent for a local art museum when i was in college and I remember I got to tour the room where many of the prints in rotation are stored. One detail that stuck out was that humidity actually had to be piped into that room because it is so dry here in the Southwest, whereas in most other places the concern is with lowering the humidity. That’s really interesting. I’ve been considering getting a dehumidifier. 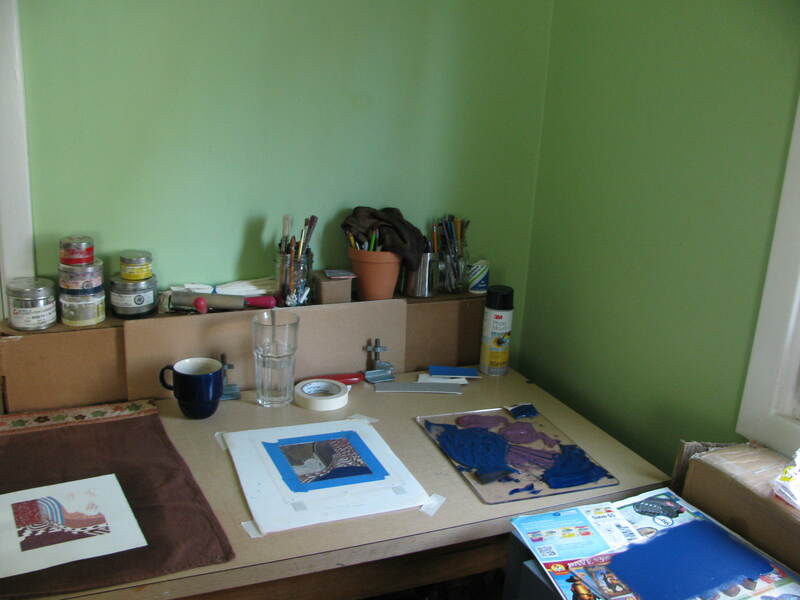 We have such a small house that one would suffice for the studio and the living area as well. Thanks for great comment Nicole. They look great so far. I loved my recent trip to Portland, but it was certainly wet. I’ve considered moving there for many reasons, but the resources and community for artists is at the top of the list. Thanks. The rain is certainly something that takes a little getting used to. I’ve been out here for six years and it is a pretty special place to call home. I just posted something about your site and added a link to it under other great artist’s. �I figured it was good to get people all caught up.